Ah, that little gold symbol. You get one, maybe if you’re lucky a foil one as well, in each pack. They can be the best of times, they can be the worst. That one card can determine what colors you play in draft. You may open 10 of a certain one and can’t pull any of the one you really want. Rares are interesting: they’re the cards that you want the most yet get the least, hence representing that they’re rare. In terms of price range in the second market they can range from 50 cents to 20 bucks for a new rare opening out of the pack. But which ones were right for the color? Again, these are new rares printed this is core set. If you haven’t been paying attention the past few posts, well then I can’t save you. You can check them out below. This would’ve even made a great White/Black Gold card, but it is perfect in Black. Thanks to some lifelink creatures as well as some black drain life spells, you do a vampire effect: you gain stronger while your opponent gets weaker. This is an interesting twist on the lifelink concept but it gets you more bang for you buck if you do that way. Example: one of my EDH decks has Sygg, River Cuttthroat as my general, with Subversion and Sanguine Blood. I tend to draw cards while gaining like and making my opponent’s lose it; very very black. Yesterday was commons and today we go up in the rarity scale to uncommons (as seen by the title). There are some interesting choices here in silver land as I believe one of the best cards in the set will be shown here today. One color was completely hard to choose since there was so many new good choices. I really like what Wizards did here in this Core Set identifying the colors, much better than previous Core Sets. Remember, these cards are one that haven’t been printed before since this is the first Core Set with new printed cards. I’m also not looking at functional reprints (bye bye Act of Treason) nor cards that changed rarity (welcome back Serra Angel). As the name suggests, this is “virgin” pie, something I’m sure that most gamers are familiar with (Ugly stereotype, I know it is but the jokes write themselves). Put target creature card in a graveyard into the battlefield under your control. That creature is a black Zombie in addition to its other colors and types. While it does cost more than Zombify, I believe it’s a better one. If you brushed over the card due to it’s casting cost, please note that it does say “in a graveyard.” As we learned in Fight Club it’s company policy never to imply ownership…, it’s always a, not your. As a Black mage you should be able to take control of your opponent’s graveyard. Also, the fact that it now turns the creature into zombie (which would’ve made more sense on Zombify) is perfect flavor for Black. By now M10 has been released and hopefully you’ve been playing with it for a few weeks now. This will be a different type of set review as I won’t look at cards that you should be playing, but cards that should be printed due to the Color Pie. Sometimes they’ll be a little over-costed or not powerful enough to see serious play, but they’re great examples of what the colors should be. As you know by now, Wizards printed new cards in a Core Set since Alpha. This, by very definition, are virgin cards. I am not going to look at functional reprints of cards (Runeclaw Bears, Essence Scatter) nor am I looking at Mythics (every color got at least 1 new Mythic card and we may save it for next year). Today we look at the commons from M10. There are some very good first timers here as Wizards wanted to get back to more of a fantasy route. I believe they hit it out of the park. Without further ado, let’s look at the cards. Black is the color for getting whatever it wants for a price. As various cards in the past have shown, Black is always comfortable with paying life to draw cards. While I was campaigning to have Night’s Whisper in a Core Set, this is not good if not better in various situations. Not only can you draw a card, but you have a teammate draw or even an opponent if you want them to lose life or deck themselves. I am really surprised this card is common, but it is really that good and fits black perfectly. Sigh. Anyway, we’ve got rares to look at today. Remember, these are not the best rare in the set in terms of power, but the ones that are the best designed for the color. This is the first time they have been printed in the Core Set, so that limits our options. Some of these, no doubt are powerful, but stick with the color’s philosophy. Same deal. Hopefully you were able to predict that this is what I was going to do. The logical step from common to uncommon to, what’s that? Oh, yeah, rare. Rare just like the buffalo steak I had a couple of weeks ago. Well, it was medium rare but there is no medium rare in Magic now, is there? Also, I do recommend trying buffalo; it’s better for you, and it’s pretty tasty. I’ve also had ostrich before as well. It’s a red meat (which surprised me for a bird). What, you thought that I would be talking about Magic this entire introduction? I’ve got the girls from American Pie to the right here? Do they have anything to do with Magic? Most likely not. Though, it does match up with the title of this section: Virgin Pie. See, in the movie, the guys were trying to lose their virginity (kids, situations like that are only good in movie comedies. 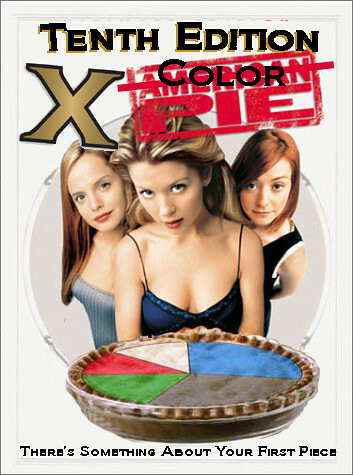 MTG Color Pie does not recommend actually losing one’s virginity to a pie). Hence, this is not only a play on the meaning virginity, (like it being printed for the first time somewhere), but a play on the movie American Pie (which my mad photoshop skills got rid of the word American). See how that all ties in together like an episode of Arrested Development? Plus, kids today wouldn’t get it if I did a Don McLean reference. Now they will. I was going to repost the first several paragraphs from my previous post to provide some kinda of consistency. Then I realized that you were going to skip it and just look at the girls to the right. Or the cards. I guess that’s why some people come here, to read cards and to learn from me. Or the girls from American Pie. But Shannon Elizabeth isn’t on the cover, shouldn’t she be? Don’t ask me, ask Paramount (Yes, that’s a SFWish image). Today, we’ve got the uncommons to look at. Remember, these are not the best uncommons in the set in terms of power, but the ones that are the best designed for the color. There’s a smaller pool now, since we’re still sticking to cards where this is their first time being printed in a Core Set (again, with the virgin remark). I think that this is an interesting exercise since it forces you to look at other cards. I mean, Cruel Edict would win for black, but it was reprinted in 9th (and as a player rewards card). By taking a look at the new cards, it tells us in what way R&D are going with each color.